Temple Etz Chaim and our Education Committee is committed to helping families with young children find a supportive Jewish community and a place to connect with other families raising Jewish children. This committee develops, implements, and analyzes programs for young children (Birth – 2nd grade) and their families. Currently these programs include Tot Shabbat and other community outreach programs. 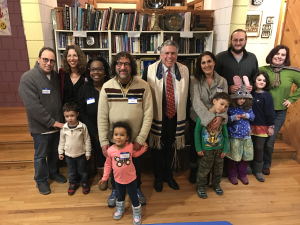 In addition, the Early Childhood Committee works with other committees to help integrate current early childhood families into existing Temple Etz Chaim programs. Tot Shabbat – Through a fun-filled, casual service of songs, stories, and a Torah parade, followed by a mini-oneg (Friday nights, Erev Shabbat) or by snacks and a craft (Saturday, Shabbat morning), we bring Shabbat to life for children from birth through kindergarten and their families. All Tot Shabbat services are held at 900 Washington Street, Franklin, MA. For more information about Tot Shabbat services please contact us. Special Events – These events are geared towards families with young children and are open to all families in the community. 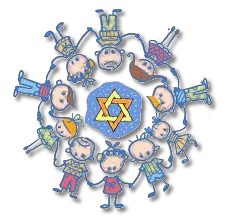 PJ Havdalah and Children’s Model Passover Seder… check our calendar for upcoming events. Temple Wide Events – These are temple events that are great for early childhood aged children. Look for Family Shabbat Services run by different grades from our religious school, Purim Spiel: Megillah Reading & Carnival, or the many other activities on our calendar. 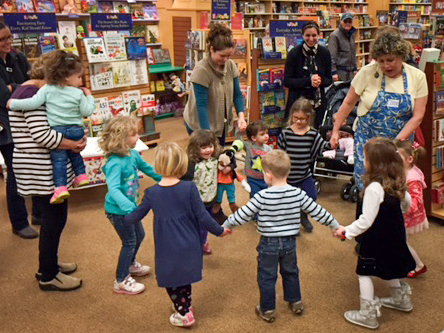 Connie Shulman, our resident social butterfly and cat herder, entertained our tiny tots at a local book store, exploring Hanukkah items – hanukkiahs with candles, draydls, gelt and display of Temple Etz Chaim literature. She read a story, they danced to the accompanying klezmer music to the book, they played rhythm band instruments and marched through the store. Then, parents and children iced sugar cookies, played the draydl game with foil covered chocolate gelt and colored a Hanukkiah and dreidel from an info packet about the holiday and Carl Citron’s potato latke recipe.